Paint your walls, try out some hardwood flooring, rearrange the room, furnish your home or build a house from scratch – all without getting off the couch. 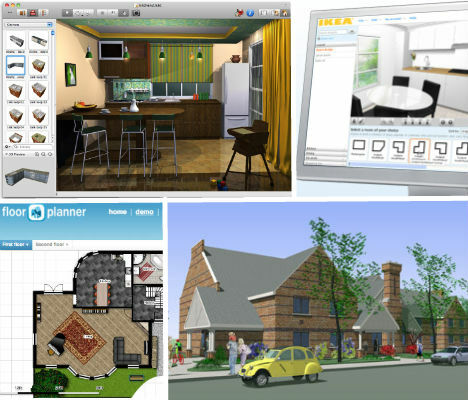 These 10 digital home design tools (9 of them entirely free) let you play architect or interior designer in 2D and 3D, getting a realistic and accurate look at your design ideas without spending a dime on unflattering paint colors and furniture that doesn’t fit. 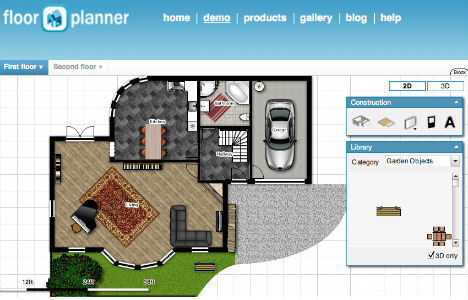 It doesn’t get much easier than FloorPlanner.com, an online modeling tool offering both 2D and 3D views. It’s free if you want to just save one project at a time, or you can go pro with a premium account. While objects like furniture, doors and other design elements are somewhat limited, you can specify dimensions for each object and get a good feel for how your furniture will fit into a space. You can stare at those IKEA cabinets for hours, but unless you’ve got a good imagination, you won’t get a real sense of how they’d look in your kitchen. 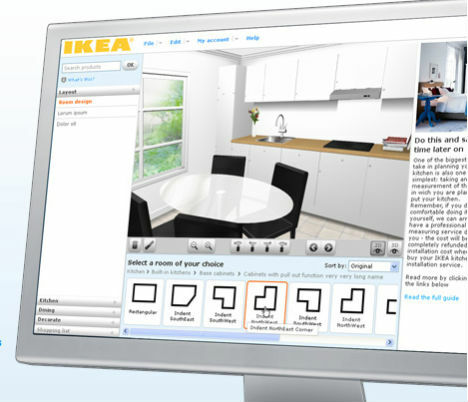 Enter the IKEA home planner, a free online tool that gives you virtual versions of IKEA furniture so you can make your home look like your very own IKEA showroom (whether that’s a good thing is for you to decide). Of course, you don’t have to go overboard with it – and it would probably help you determine whether that huge Expedit shelf system would totally overpower your living room. Not a design professional? Don’t worry about trying to figure out complicated programs just so you can determine a good furniture layout in your home. Better Homes and Gardens has an online tool that doesn’t take long to load and is a snap to use. BHG online user registration is required but the tool is free. 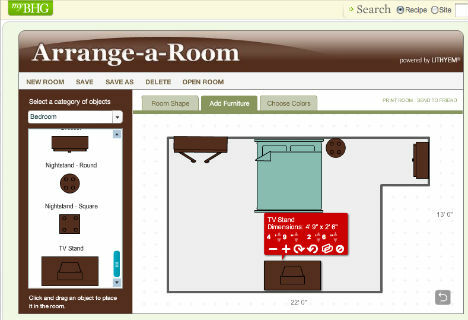 Choose a room shape or customize your own, then add and arrange furniture. Don’t you hate it when you fall in love with a color at the paint store, then get it on your wall and realize it’s all wrong? Worst of all is when you don’t realize that it doesn’t work until the whole room is painted. 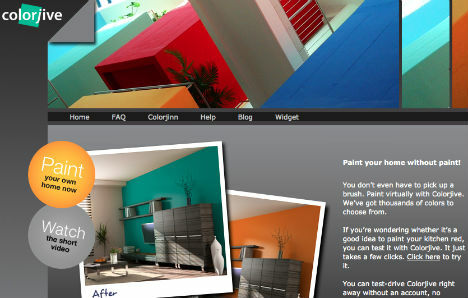 Save time, money and frustration by trying out paint colors on photos of your room at ColorJive.com. 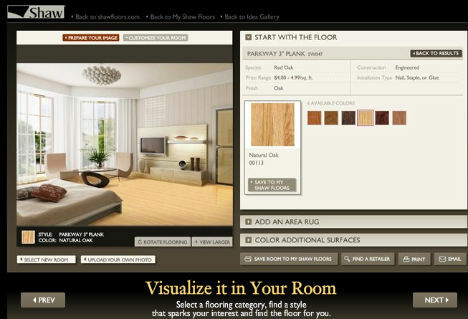 Having trouble visualizing how various flooring options would look in your home? Upload your own photo and “try on” virtually any flooring that Shaw Floors offers including carpet, ceramic, hardwood and linoleum. It’s entirely web-based – no programs to download – and free. 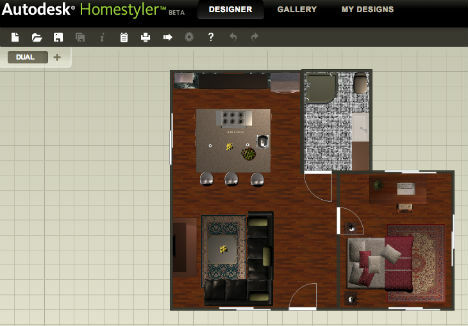 From the designers of AutoCAD comes Autodesk Homestyler, another free online tool that offers both 2D and 3D modeling so you can custom-create an interior and then decorate it with brand-name products from FLOR, Sherwin-Williams, Kohler, Dupont and more. Users have called this program ‘intuitive’, saying tutorials aren’t necessary to pick it up. If you’re just looking for a basic online tool that lets you create everything from scratch, you’ll like SeeMyDesign. 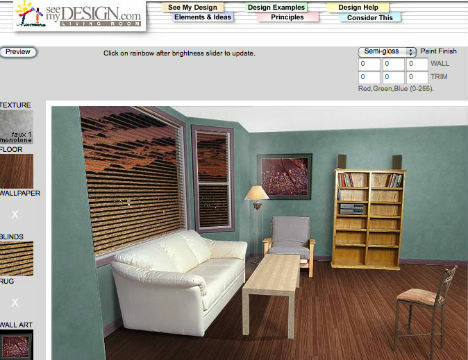 This older program lacks much of the functionality of other online home design tools, but it’s perfect for homeowners just looking to play around with ideas. Build your room, arrange furniture and add details like paint without any unnecessary extras. This tool, with its built-in cost calculator, is also useful for determining how much paint you need for a particular room and what you should expect to pay for it. Wannabe interior designers looking for a downloadable program that’s truly free – without ads or limitations – should take a look at Sweet Home 3D. 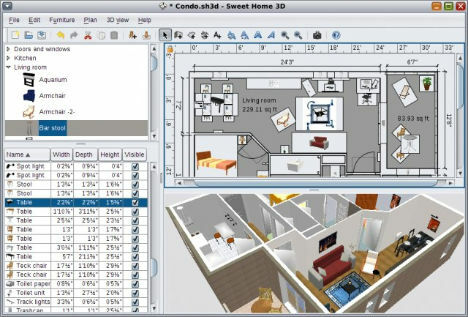 Like other digital design tools on this list, it offers both 2D and 3D views of the space you’re designing and a host of objects that can be dragged and dropped into the room. Users report that it’s easy to learn and use. Design your own concept architecture, shed, interiors or even vehicles with Google Sketchup, the free and easy-to-use 3D modeling program with loads of design objects, textures and landscapes to choose from. But Google Sketchup has just a few extra bells and whistles that professional designers in particular will appreciate, including a ‘Match Photo’ feature that lets you trace a photo to build a model and a Google Maps tie-in that allows you to assign a geo-location to your model. This program has been lauded for its wide range of uses, and it’s quick and easy to learn. 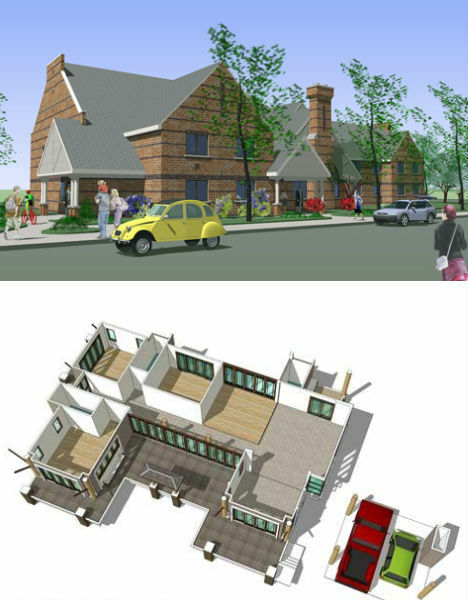 Sketchup Pro ($495) adds the ability to export your designs to CAD and create visual presentations. 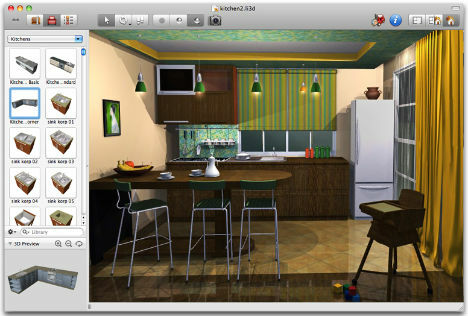 Design enthusiasts will love the realistic look of Live Interior 3D, home design software designed exclusively for use on a Mac. The program comes in both standard ($49.95) and pro ($129.95) versions, with the latter introducing the ability to edit 3D objects directly within the program using Google Sketchup. Homeowners can get an incredibly accurate sense of how their improvement projects will look with an extensive database of objects and surface materials and the ability to customize the smallest details including lighting within a room. Perhaps the coolest feature is the ability to “walk through” your design in 3D (a view familiar to first-person gamers), and you can even create virtual tours.